Fat Cat (Derby) Is this your restaurant? Food was delicious! Great service and atmosphere. Good food but lacking in atmosphere. Excellent experience, bargain 1/2 price deal even though we picked some items not in the deal. Would definitely return and have already recommended to friends. Really good value & excellent food! Super meal again, be there next week. Had a lovely late lunch with family and friends. Food choice is very good as is the value for money on half price Tuesday. Food was excellent. This is a favourite of ours if in Derby on a Tuesday. Love eating here! It's my 1st choice when we go out in Derby, although service didn't seem as attentive last night, but food was lovely! Another lovely lunch on half price Tuesday. Great value and good menu! Fabulous food and cocktails as always! Fat Cat was very good ! Service very good, a good evening! Very good Burgers, lovely atmosphere! Food is good and plentiful, but they do have a habit of running out o certain items such as breads and chorizo, so some need for improvement. Also, the waitress is not experienced enough. Very tasty meal an excellent pricing for 3 course Mother's Day meal. I will definitely be returning. Food was lovely. However, Service was a bit slow. Never got the desserts we ordered and my mum did not receive a free glass of prosecco. To rectify we were given 20% off our bill. Would return. Enjoyed the meals we chose and there was a good selection. Waitress very helpful. Glad we booked for 6pm as it became increasingly noisy later on. Always fabulous service and great value for money! Love Fat Cat! Very well cooked food at fat Cat. Very quick service was never waiting long. The staff were really friendly and helpful, plus with the student offer it was great value for money! Excellent all-round service at Fat Cat. Will be coming back! Booked with 2 friends for the 3 course Xmas meal at Fat Cat, the food was excellent and the service was very good. The young man that attended to us was brilliant! Offer included half a bottle of wine each which was very enjoyable. Overall a very good evening with very good value for money. Couldn't fault it at all at Fat Cat (Derby), lovely. We were celebrating a birthday on Half Price Tuesday so this made the meal very good value - little bit pricey otherwise. Good food, nicely presented, polite, attentive, helpful staff. Great atmosphere and Fat Cats is a very cool place to spend some time. Amazing cocktails - we tried Parma Violets and the Drumstick ones plus some Jam Doughnut shots to finish off the evening. Will be recommending Fat Cats! Food was beautiful again, however we had to ask for the oils to go with the breads and fishcakes. The only downside was the hour wait for the starters, but will definitely be back again soon thank you. Another great value lunchtime meal with my Mum and Sister. Food great, friendly staff and all at a great price on a Tuesday. This was our first visit, but definitely will NOT be our last! We enjoyed a warm welcome, friendly and efficient service, the menu was varied and exciting, and the taste and quality of the food was absolutely first rate! 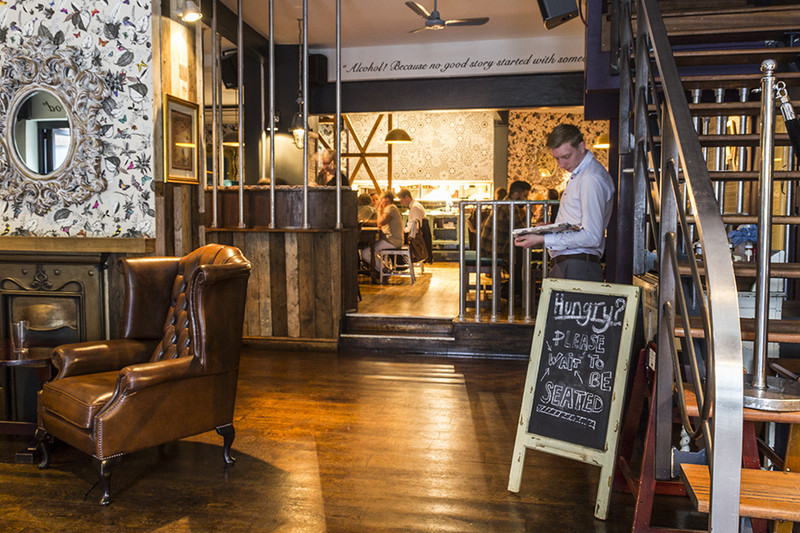 A lovely, warm and welcoming atmosphere, and superb value for money on their 'Half Price Tuesday' offer. Excellent food at Fat Cat, service very good and the pudding was gorgeous. The wine was good too! Excellent food, excellent service, and very good value! I highly recommend Fat Cat! Food was excellent, hot and well cooked. Very good atmosphere and all four in my party really enjoyed it. Will go again. Hi my 2 friends and I really enjoyed our meal last night. We have been several times to Fat Cat and have never had a bad meal. My 2 friends were a bit disappointed when they asked for cream with their desserts and they only got 2 very small blobs of cream. However when they asked the waitress for pouring cream, she came back with some straight away. So only a minor complaint which was quickly rectified. Overall a great experience. This is the 1st time our work team has been to Fat Cat, everyone was really pleased with their food. Excellency value and super food. Will definitely be coming back. Excellent food and very good value at Fat Cat! The food, wine and service were exceptional at Fat Cat (Derby)! The offer for Tuesdays will certainly bring us back, we were a party of ten on a reunion meal and thoroughly enjoyed our evening. Well done Fat Cats, will recommend you. It was a birthday meal for my mum at Fat Cat. The food was lovely! Excellent, food, service, staff, really enjoyed it. Lovely food and fantastic value for money! Love this deal on a Tuesday at Fat Cat (Derby). Have been several times with different friends. Always have a good meal! After having to wait 20 minutes for our booked table, we all enjoyed our meal very much. The food was excellent, good size portions, service friendly + mostly efficient. Value for money is excellent. Will definitely be coming again! I was a little disappointed that the steak I had was a bit tough. When I've had it previously it melted in your mouth. The service + atmosphere were good as usual as was the value for money at Fat Cat (Derby). Will probably not have the steak again though. I went with two of my friends and we all really enjoyed the whole evening. The service was quick and friendly and the food was lovely and tasty and very good value for money. We'll definitely be going back again! Meal was good plentyful and hot. The breakfast was amazing and really good money £10 for 2. Afternoon Tea at Fat Cat Derby was amazing. Definitely value for money. Loads of sandwiches and cake. Tea served in a vintage pot, proper china cups and saucers and prosecco too. Service was great. An afternoon well spent! Really good price too. More info on Fat Cat's facebook page. Worth a look! A lovely night - thought the shiraz was amazing - brilliant wine list and the tuesday discount is brilliant value - thank you. We had a really great meal and thought the sharing platter was brilliant - good service and friendly staff. Thank you. We really enjoyed our meal but the service was slow between courses however the waitress dealt with the situation rapidly and politely and I imagine that this is because on tuesdays it is so very busy. Excellent night thank you. Loved the half price offer on Tuesday, staff were friendly and helped my friend who required Gluten Free food, with her choice. It would be good though, if there was a Gluten Free menu available in the future! Expected a wider choice of menu. Only one steak option which was rib eye. Burger meat delicious but too much cheese spoiled it. Overall we enjoyed the meal. Had an enjoyable meal, but the onion rings were served cold and my steak had loads of fatty gristle. I booked a table for 18 at Fat Cat, the food was quickly served piping hot and delicious, would definitely recommend. Food was fantastic on our visit to Fat Cat (Derby). 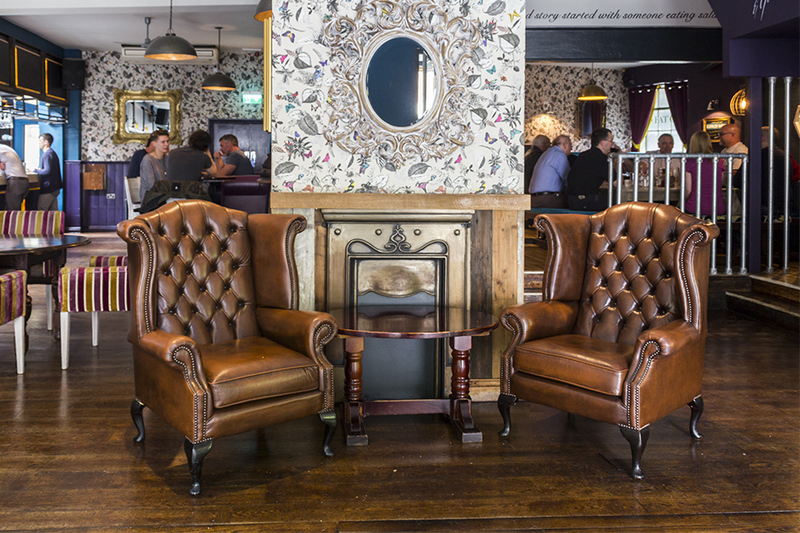 Great value on two for one Tuesday deal at Fat Cat (Derby). Service efficient and friendly. Good food, good portions. Couple of bits maybe a bit over/under cooked or rushed, but it was a busy time with many groups having Xmas do's. Thanks for a lovely evening! Friendly staff, very good food and speedy service at Fat Cat in Derby. They earned their tips! Excellent all round will definitely return to Fat Cat in Derby. The service was excellent. The staff were very friendly and it was very good value for money. Will definitely be returning. It was an enjoyable evening. The service was good and the staff very attentive. The food took a little while (this is because we were a group of 11 and we didn't pre-order). Some of the food was good e.g. the burgers but the crab cakes had more potato in them than crab. But £9.95 for 2 courses and a cocktail is value for money. I am sure we will go again. We had a great meal here - the food was good and my partner really enjoyed her cocktails too! I thought the staff were polite and friendly without being too fussy, which is always nice. 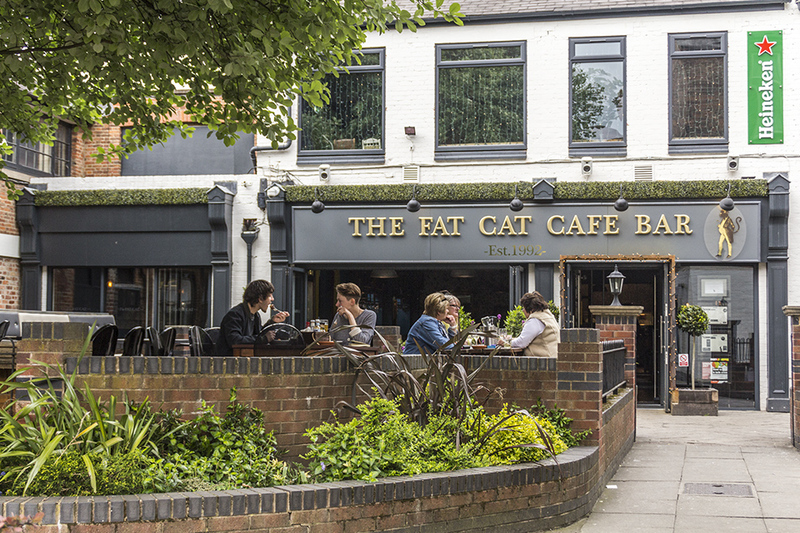 Situated on the lively Friar Gate, an area of the Cathedral Quarter in Derby city centre that is quickly becoming recognised as the destination for drinking and dining, you will find Fat Cat. 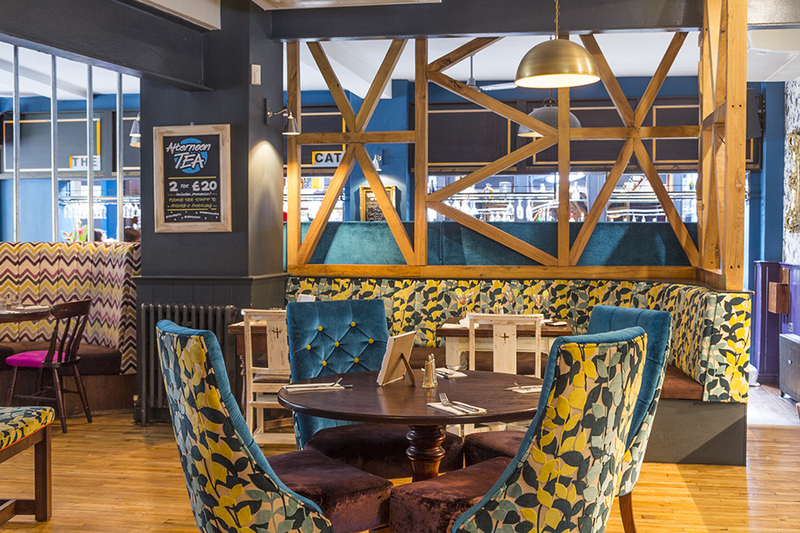 Derby’s Fat Cat is ideally located for locals and residents alike to make the most of their superb pre-theatre, lunch time and a la carte offers. 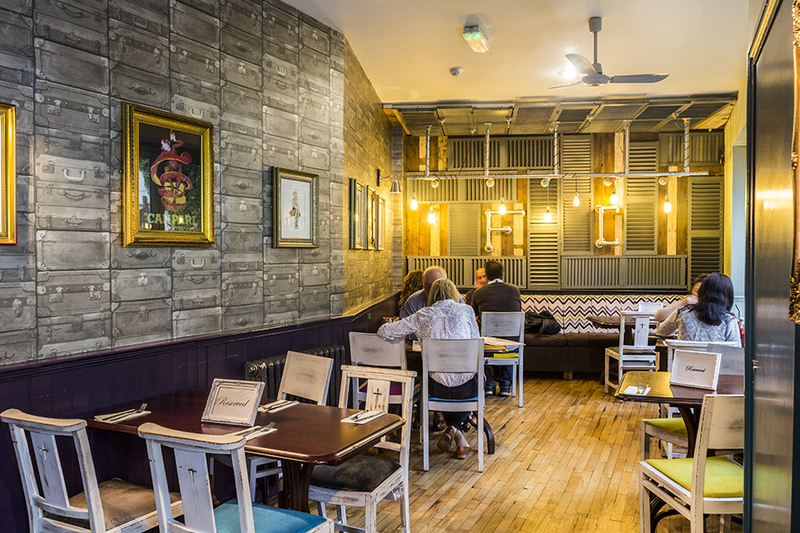 Spread over two floors with a spacious lounge and bar area that is filled with comfortable, dark leather booths and lots of small wooden tables dotted around the venue which are perfect for enjoying a quick bite to eat with friends and family. With squashy leather sofas arranged around a heater, you’ll be kept warm in the winter and during the summer you can enjoy the food whilst soaking up the rays in the al fresco dining area. 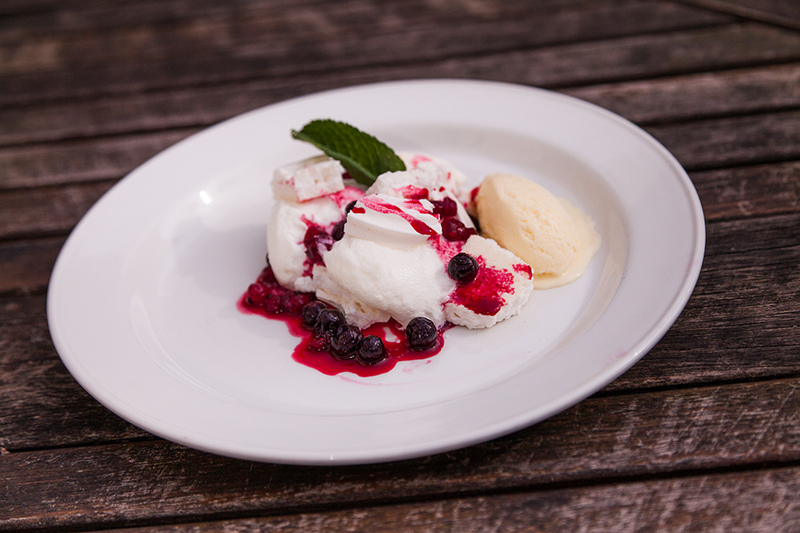 The menu at Fat Cat offers a mixture of classic British and European dishes that will suit everyone. 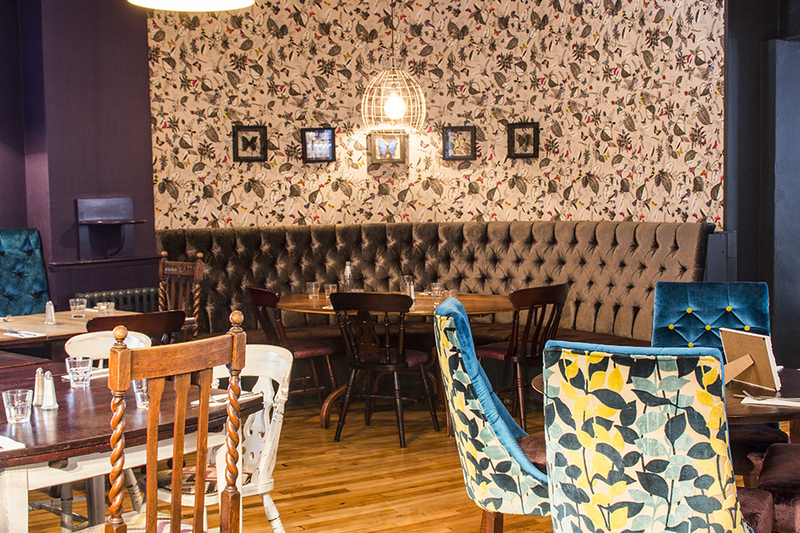 Start your day off right with a trip to Fat Cat in Derby and treat yourself to the Full English or Eggs Benedict. 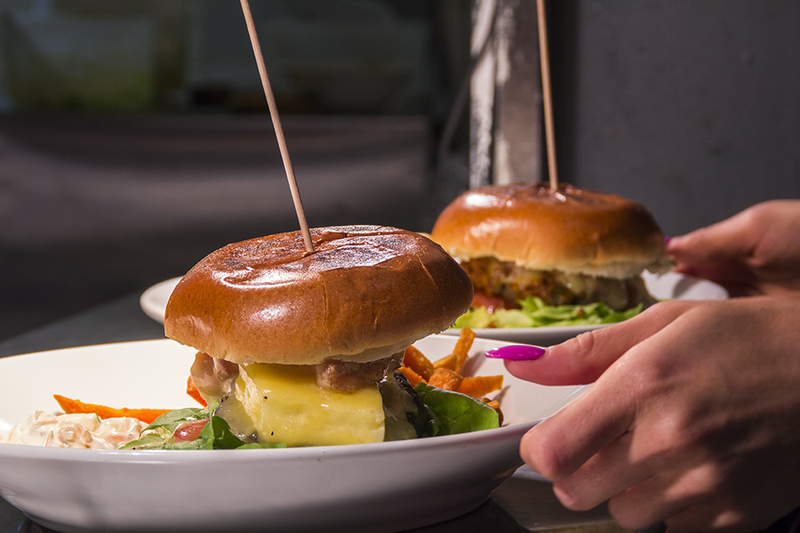 With dishes such as bangers and mash, the famous Fat Cat burger topped with bacon, mushrooms, onions and cheese sauce, and king prawn linguine, you’ll find yourself spoiled for choice at lunch or dinner. 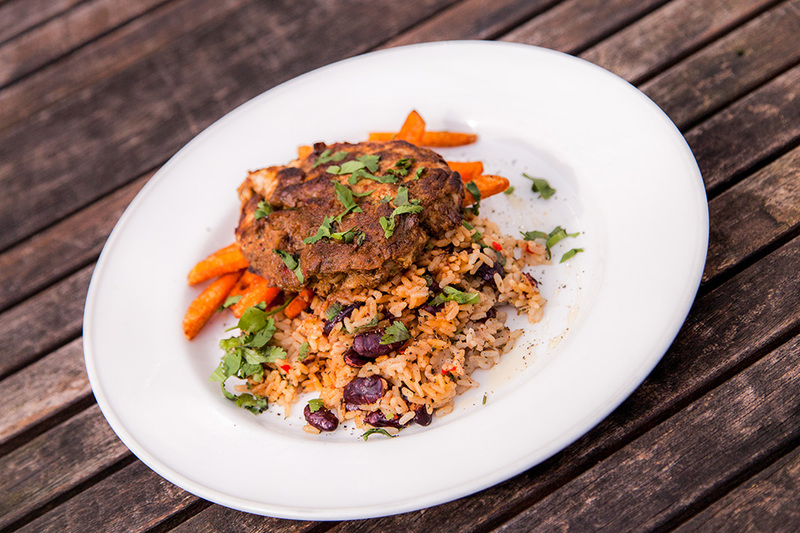 For those who are conscious of their waistline, a healthy options menu is also available that offers grilled fish and chicken alongside lower calorie options. Every Sunday the restaurant offers a delicious beef, pork, chicken or nut roast, with all the trimmings, Yorkshire puddings and – of course – lashings of gravy. Fat Cat is as much about drinking as it is dining and to quench your thirst there is an extensive range of international bottled beers, craft ales and wines as well as a fabulous variety of cocktails on offer. The venue runs a variety of special offers including set menus, cheap cocktails and student discounts. 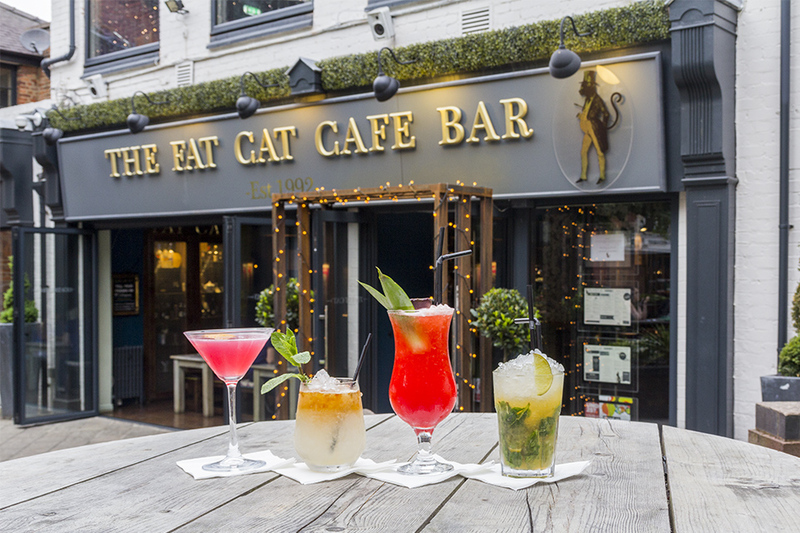 If you are looking for a lively venue for a quick bite to eat with friends, an intimate evening meal with a partner or just a comfortable place to enjoy a few drinks then Fat Cat Derby is for you. 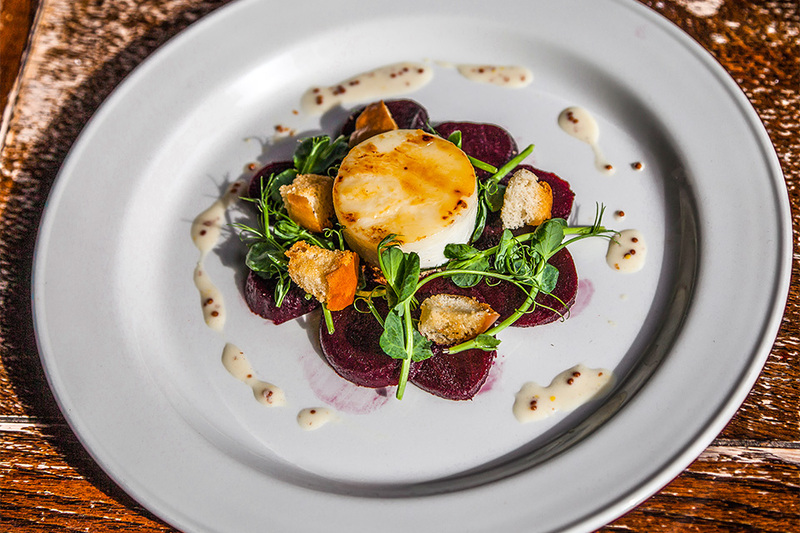 With fabulous price set menu and great value for money, you can’t go wrong with this lively, trendy venue in the heart of the city centre. All our burgers are served in a seeded brioche bun lettuce, tomato with house slaw and homemade triple cooked chips. All our Pizzas are homemade and hand rolled with freshly baked dough. We then smother them with our own recipe tomato sauce and mozzarella.